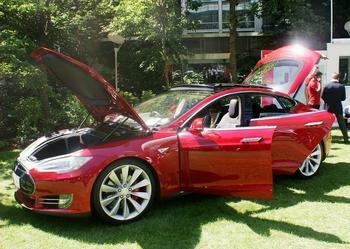 PALO ALTO, California, August 4, 2014 (ENS) – Electric car batteries are about to get cheaper and more abundant. Panasonic Corporation and Tesla Motors signed an agreement Thursday detailing their cooperation to construct and operate the Gigafactory, a $5 billion, large-scale lithium-ion battery manufacturing plant in the United States. But Tesla said it is still evaluating locations in four other states, raising California’s hopes, along with those of Arizona, New Mexico and Texas. The Gigafactory will produce cells, modules and packs for Tesla’s electric vehicles and for the stationary storage market. The the 10 million-square-foot Gigafactory is planned to produce 35 gigawatt hours of cells and 50 GWh of packs a year and employ 6,500 people by 2020. Under the agreement, Tesla will prepare, provide and manage the land, buildings and utilities. Panasonic will manufacture and supply cylindrical lithium-ion cells and buy the associated equipment, machinery, and other manufacturing tools. The Gigafactory is being created to enable a continuous reduction in the cost of long range battery packs in parallel with manufacturing at the volumes required to enable Tesla to meet its goal of advancing mass market electric vehicles, the two companies said in a joint statement Thursday. Last October 30, Panasonic agreed to expand its supply of automotive-grade lithium-ion battery cells to Tesla, updating their 2011 arrangement to cover the supply of nearly two billion cells over the course of four years. 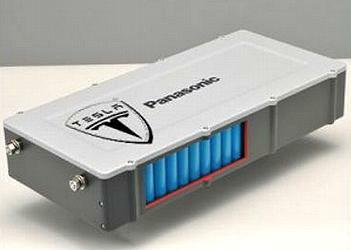 Tesla will use the Panasonic lithium-ion battery cells to power the Model S as well as the new Model X, a performance utility vehicle scheduled to go into production by the end of 2014. Until the Gigafactory is up and running, Tesla will continue to purchase battery cells produced in Panasonic’s factories in Japan. The Gigafactory is expected to bring down the cost of automotive lithium-ion batteries. Cost reductions will be achieved through optimized manufacturing processes driven by economies of scale previously unobtainable in battery cell and pack production. Further price reductions are achieved by manufacturing cells that have been optimized for electric vehicle design, both in size and function, by co-locating suppliers on-site to eliminate packaging, transportation and duty costs and inventory carrying costs, and by manufacturing at a location with lower utility and operating expenses. “Tesla plans to build this factory with a $5 billion investment. Tesla has already raised over $2 billion to fund this project and it is to be seen what contribution Panasonic will bring to the table,” said Sapru. Sapru projects that the lithium-ion battery market for electric vehicles which was $3.2 billion in 2013 will grow at a compound annual growth rate of over 32 percent. Several new vehicles are expected to be launched across the North American, European, and Asia-Pacific markets, while demand for hybrids will remain strong.